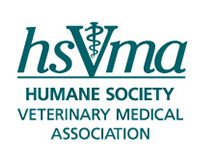 The Humane Society Veterinary Medical Association (HSVMA) was formed as a home for veterinary professionals who want to engage in direct care programs for animals in need and educate the public and others in the profession about animal welfare issues. See below for information on how to contact HSVMA. To protect and advocate for animals while providing leadership and service opportunities that support a humane veterinary profession. The Humane Society Veterinary Medical Association has offices in the Washington, DC metro area and California.